A comic book Halloween wouldn't be complete without a few 1950s fear-fests. Man, those Fifties cats really knew how to horror things up, how to jive and jazz and wail! Then the Comics Code came and the music stopped. For a while. The jam moved over to the Warren black and white mags but full-color monthly comics ended up stunted. By time I was a comic book-reading kid, we had a few cool DC anthology series, but the granddaddy of them all was simply a legend. I'm talking EC. You could order expensive hardcover, slip-cased reprints, but those were for the old guys with their disposable income, brandy snifters and smoking jackets. It wasn't until Russ Cochran and Gladstone Publishing started reprinting Tales from the Crypt, Vault of Horror and The Haunt of Fear and selling them through newsstands that I was finally able to read those fabled classics in color. But I soon learned EC wasn't the only publisher doing sick horror in the 50s. You know how it went with comics back then-- if something proved a money-maker, everyone in the business flooded the market with their own versions. Heck, I don't even know who published the original horror hit. EC just did it best, and they're the ones who took the blame when Uncle Sam cracked down on too much of a good thing. Those other publishers doing the EC thang back in the day interested me greatly because of my appetite for pre-Code horror, but those remained fleeting phantoms that haunted the periphery of the whole tragic tale. Until now. IDW's Yoe Comics packages this book they call Haunted Horror where you can find stories from a lot of those non-EC guys. I just bought a bunch of them on Comixology (.99! ), and I'm loving them. Some of them feature art by recognizable names-- the Iger Shop, Joe Simon and Jack Kirby (Whatever happened to him? He showed real promise! ), Jack Cole and a guy by the name of Ditko who later did some kind of bug-related hero the kids seemed to like. Some of them are just crude and weird and even a little off-putting at times. But yeah, I'm loving all of them. EEK!! It's Jay Disbrow's version of Mel Brooks' Pizza the Hutt, only 33 years early. The long tongue is an especially nice detail. 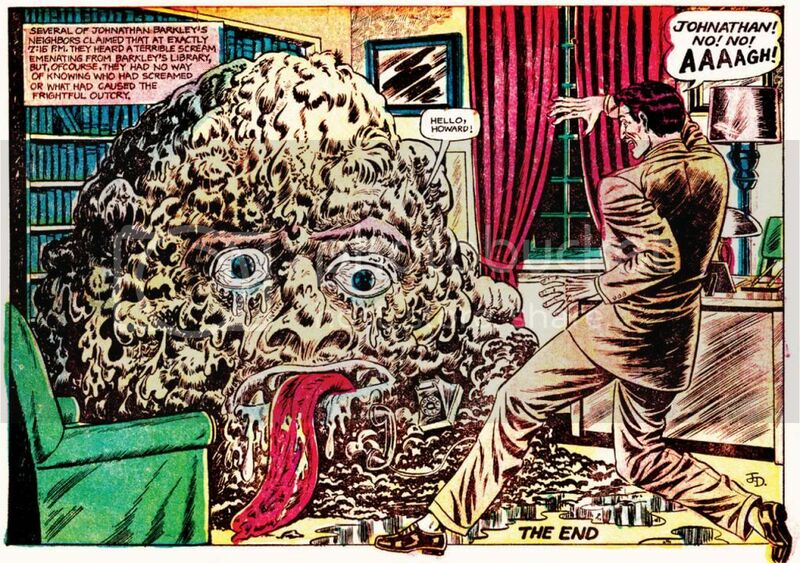 To add a little context, the guy screaming is the blob's doctor. Or he was, when the blob was a man. If you'll look closely-- dare it-- you'll see a rotary-dial telephone kind of sloughing off the blob's side. The doctor came in response to a call from that very phone, and if you're puzzling out how something like this mass of what appears to be melted flesh could manage to spin that old-fashioned dial, I refer you back to the tongue. That's what a good horror comic should do for you. Put you off your feed. Junji Ito's Uzumaki is a more recent example of a horror comic that turned my stomach. Another old one is the story "Tight Grip!" illustrated by Jack Davis. In that one, a murderer stupidly hides inside the sentient trunk belonging to his victim and it compresses him. His meaty parts stream out in thin ribbons through bullet holes he shoots in the trunk and investigators find nothing inside the tiny trunk but a cube of powdered bone. Grotesque. Gives me a chill just thinking about it. "Tight Grip!" ran in EC's Tales From the Crypt #38 (October-November 1953) and you can read it today in the Fantagraphics volume devoted to Davis' horror work, 'Taint the Meat... It's the Humanity! And now we have Disbrow's blob. Anyway, a big thanks to Craig Yoe, Steve Banes, Clizia Gussoni and all the people at Yoe! Studio and IDW for putting all this effort into putting these stories back into print and broadening my experience of 1950s horror comics. And also making me sick. *A blatant lie. I've been making a pig of myself. October is Spookey Month... again!